On December 25, 1944, Greensboro native George E. Preddy Jr., the top P-51 Mustang ace during World War II, was shot down by friendly ground fire. Preddy was a barnstormer pilot before the war. He tried three times to become a naval pilot but was rejected because of health problems. The Army Air Corps accepted Preddy, placing him on a waiting list for a cadet class. In 1940, he joined the National Guard, and he received his wings in December 1941. In July 1942, Preddy was involved in a midair collision during training. Following a three-month recovery, he returned to the United States, and was eventually assigned to a squadron that was sent to Great Britain. He shot down his first plane in December 1943. In April 1944, his squadron received the P-51 Mustang, and Preddy became the 487th’s temporary commander. 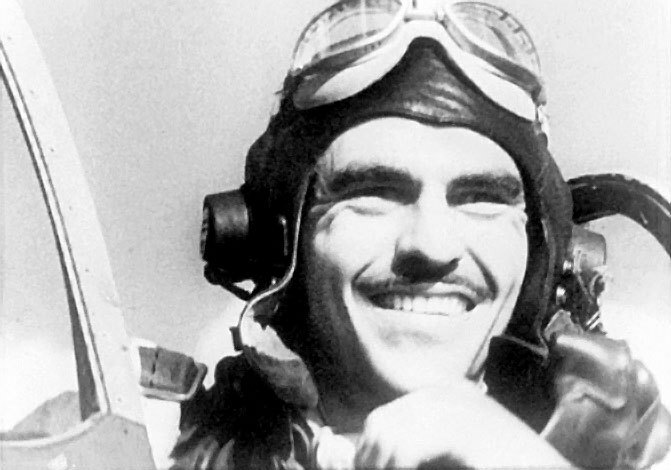 He downed six planes on a single day in August of the same year, earning himself a Distinguished Service Cross—the nation’s second highest award—in the process. Preddy was shot down during the Battle of the Bulge while flying in his plane, the Cripes A’Mighty, in pursuit of a German plane. He is buried at the Lorraine American Cemetery in France.